The fabric I talked about in the last post (When you don't like your warp) has become a charming blouse! 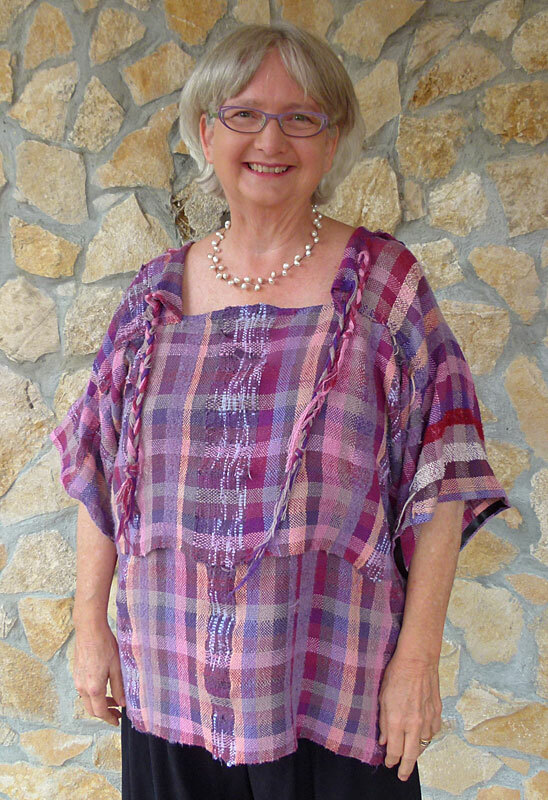 Working with my seamstress friend Rebekah Clark, I designed an outfit by draping my fabric in a casual style on my dress form. Rebekah loved the look and worked to maintain the spontaneity of my design. For example, to make the top row of fabric in the bodice hang loosely over the second row that wraps around the hips so she added an inner slip. I'm finding it is the small details that make an outfit really well made. I am blessed with several excellent seamstresses in my life right now! I also love how we got the fringe ends to become part of the neckline and how you can tie the fringes together to pull more fabric over the shoulders when the night air turns chilly. This outfit came out so well, I am encouraged to make some more clothes. So for now my loom is folded up in the corner, the dress form takes center stage and I'm concentrating on making clothes out of all the fabric I have made in the last 3 months. Back view showing fringe being used to close the back when the weather turns cool.